Thank you so much for your sweet responses to the clothing label post! I had lots of questions about the labels so I thought I would answer them all in a post so everyone can see the responses. How long does it take to cut and iron 300 labels? Why do you sew them before you sew them onto a product? I have sewn these labels on things in all different ways. When I iron the edges down and pin it directly to the garment or project, the edges of the label always skew. It’s easier to get a good looking label when you sew around the edges first. The double stitching all the way around looks really professional and sturdy. It can be done without sewing first, but it looks better when you do. Couldn’t you do this without the ironing part? Yep, I’ve done that too. I have used heat-n-bond to apply the logo to a project and then sewn over the edges. The edges will eventually fray a little. If I am going for a deconstructed or natural look, or if I just don’t care, I do this and just let the edges fray. A tight zig zag stitch around the raw edges will also give you a professional look, although I find this takes more time. I have also glued and sewn the labels onto paper for product presentation. It just adds a little something to have your logo plastered everywhere. What about printing it on a different fabric, like canvas or twill? 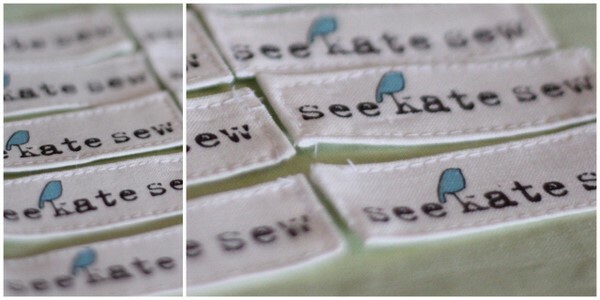 I made my labels a long time ago before Spoonflower had more than just basic cotton. When I run out of these labels, I am going to spend a little more for a cotton twill. Twill doesn’t fray easily and the label will be thicker. Thus, eliminating ironing altogether. Let me know if you have any more questions! I am happy to help! march giveaway! that one day my kids spilled a whole thing of baby powder in the pink bathroom and other stories… penelope pattern tour: very shannon New pattern! The SAGITTARIUS! Great questions (and answers!) Thanks for sharing! Thanks for the post! I just got my fabric in the mail and my logo was really small so I cut it into strips to make ribbons instead which turned out pretty cool too. I also read the fine print on Spoonflower and figured out what I was doing wrong and placed a new order. My teeny labels work too, I just glue them on other productand since I have thousands of them now I’ll be able to label everything!